Is base flattening and structuring with the SkiVisions Base Flattener expensive? NO! It is true that you have to make the initial capital investment in the tool and inserts, but thereafter all inserts are re-sharpenable an infinite number of times and RARELY need replacement. We show you how. What is unique about the SkiVisions Base Flattener? It is the only effective hand tool ever produced that provides a superior alternative to stone grinding or flat filing. Why is this uniqueness important? How is the uniqueness accomplished? The Base Flattener is a large and powerful planing tool that can eat either plastic alone or plastic and edge metal, depending on the blade used. The Ruby Stone Blades (see description below) are 6 inches long and come in medium and coarse grits for different structures cut into the base plastic while you are flattening it. The Ruby Stone Blades require no skill to use. Since they cannot cut metal to any significant degree, you cannot cause problems that aren’t easily corrected. The steel blade requires some skill and care when using it, but it is a powerful blade that can slice through steel and plastic on ski bases simultaneously and can be re-sharpened an infinite number of times (see “Stone/Steel Inserts Maintenance). However, we now prefer using the File Base Flattener on metal edges and just use the steel blade for final finish on the p-tex. The Base Flattener is a push tool which means you push it down the ski base from behind the tool. The Base Flattener is pushed in the tip to tail direction only. Use only light pressure with the steel blade, moderate pressure with the Ruby Stone Blades. Use overlapping strokes and pull the tool back between strokes. The primary pressure is applied with your back hand on the large hump. The front hand on the small hump is primarily there to guide and control the tool. Look at the picture to the right closely and you will notice that the stone blade is lifted off the ski base, yet the front black glide bar is still on the ski. We recommend that when you are pulling the Base Flattener back in the backstroke that you leave the front of the tool on the ski base, but that you pick up the back of the tool slightly so that the blade does not touch the ski base at all during the backstroke phase. You will not make hairs on your base if you make sure that the blade is not touching the base on the backstroke. You will make base hairs if you pressure the tool on the backstroke. DON’T PRESSURE THE BACKSTROKE! The Ruby Stone Blades only cut base plastic when the grit is exposed, the grit gets quickly clogged with base plastic and the stone needs to be cleaned frequently by brushing with the brass brush which comes with the Base Flattener. Always clean the wax from your base with wax remover before using the Ruby Stone Blade as wax will clog the grit more readily than will polyethylene. The Ruby Stone Blades are completely different from the old stone blades. They are sharper, more powerful, easier to use, produce far better results, leave an incredibly clean and hair free base, and can be re-sharpened numerous times, which re-sharpening returns them to near new performance. If they are sharpened so many times they no longer fit in the tool, folded paper shims can be made so they can still be used. They have a very long usable life. The coarse blade is primarily used for efficiently removing plastic from a convex (base high) base. It is a very aggressive blade and should be followed with the steel blade to de-structure the base. The new Ruby Stone Blades are aluminum oxide stones, the highest quality aluminum oxide grit there is, and they have two unique characteristics that make them particularly effective. First the grit is much sharper than standard aluminum oxide so they cut more rapidly. Second, the grit fractures to new sharp points, much like the diamond grit on a fine diamond file, so that when the Ruby Stones are re-sharpened, their performance remains consistent with (although not quite as sharp) as a brand new stone, the sharp new points being replenished every time it is sharpened. They take only minutes to re-sharpen, which also re-flattens them, so doing it frequently really pays. They are, quite frankly, the best of all worlds. The Ruby Stone Blades give skis better performance than stone grinding. Why? One of the important aspects of sintered polyethylene bases is that they are porous. The porosity naturally allows the base to absorb more ski wax, and it helps reduce surface tension thereby increasing glide. Because a Ruby Stone cuts the polyethylene so cleanly, the pores are left open. Stone grinding, on the other hand, causes the polyethylene to move laterally (smear or creep) on the base due to the speed and pressure of the stone, resulting in the pores getting partially covered up with plastic “creep”. Using the Ruby Stones is a “no-brainer” approach to base flattening and structuring. Just keep them off the metal edges, which cause them to wear excessively. You can feel when the stone is on the metal edge, use the steel blade or the SkiVisions Ski Sharp to bevel the edge before continuing with the Ruby Stone, or better yet, use the File Base Flattener to bring the steel edge flush to the base. Also, when the ski is convex (base high), always flatten it with the Ruby Stones, never the steel blade, the steel blade is for concave skis when you want to take down metal, or the File Base Flattener. The coarse stone blade is the most efficient and effective insert when taking down a base high convex base. Always clean the wax off your base with wax remover before using the Ruby Stones, wax will clog the grit. What is structure on a ski base? It is the process of roughening it to reduce surface tension. If your base is very smooth, surface tension, simply put, is suction from a lack of air between the base and the snow, which slows its glide. Very smooth bases tend to be very slow bases. 1. In new, cold snow the structure needs to be fine. The newer and colder the snow, the finer the structure. 2. As snow gets older, the crystal points start breaking down, so you can then go to a medium structure. 3. As snow goes through multiple freeze and thaw cycles the crystals lose their sharpness and so a coarse structure works best. 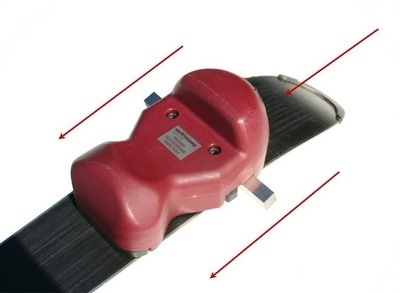 A true bar is a critical, must have ski tuning tool, it is used to inspect ski base flatness. They are easy to use but you must have a strong background light to “read” the base. We like inexpensive drafting lamps where the light can be focused at the tip. Tip the true bar up on edge as seen in the picture when reading base flatness. As long as you have a decent true bar and a strong background light, reading your base is very simple and obvious. If a ski is flat, there will be a solid, unwavering light band across the width of the base. It will be very obvious that is it flat. If the ski is concave, there will be a greater amount of light coming through at the center of the base than at the ski edges (“edge high”). This will be very obvious. If the ski is convex so that the base in the center of the ski is higher than the edges (“base high”), the light band will be more narrow at the center of the base, wider over the edges. The Ruby Stone Blade is used to correct the convexity. Keep in mind that you can also observe your base flatness just by the structure pattern. If it is consistent the entire base, it is flat. Inconsistencies disclose high or low spots and are generally easy to see. It is common for ski bases to have waves on them, and stone grinding will not remove them because the stone rides up and down with the waves. The waves have to be cut off from an angle. Also, they cannot be seen. If you use the Base Flattener at an angle as shown in the picture, you will find there is more drag in certain spots than others. Those spots with extra drag are base waves. As you continue to make additional passes on the base you will find the drag at that point becomes progressively less and that finally it disappears, the wave is removed. You won’t put in skip marks if you keep the blade nice and sharp and use the tool with a lighter touch, letting the tool do the job rather than over-muscling it. If you have a rock hardened/damaged section it needs to be polished out with the Ski Sharp Stones before flattening with the steel blade. If you do put in skip marks, they won’t damage the performance of your skis. They just don’t look very good. To remove, angle the Base Flattener and use the Ruby Stones, the angle used coming from the opposite angle as the skip marks in the base, they have to be cut off from a cross-angle. Due to the curvature of the ski at tip and sometimes at tail (flip tail skis) using the Ruby Stone Blade by hand can sometime work better than in the Base Flattener. Just keep the blade up on edge and follow the contour of the base to get a uniform structure across the width. If your ski is very concave it is best to use the File Base Flattener, the steel blade is best kept for fine detail work rather than using it for heavy work. It is VERY IMPORTANT to polish off the burr that is left whenever you work on metal ski edges, a burr makes the skis over-sharp and dangerous. 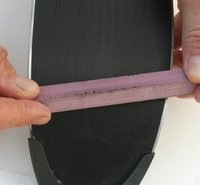 We recommend the SkiVisions Ski Sharp for such purpose, or you can polish the edges by hand with a stone. The steel blade falls from the tool when the retaining screws are loosened. It is sharp and heavy and should be done over your bench carefully. Maintain a firm grip on the tool when running it off the tail of the ski so you don’t drop it. Keep your fingers on the tool and out of the way of the sharp metal ski edges. 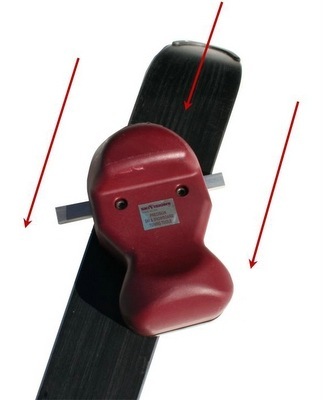 Your ski must be held in a ski vise when using the Base Flattener.